Bosso, who won the Cameroon Cup in 2013 with the team, was taken hostage as he headed to a training session at the club's stadium. "Coach Ndoumbe Bosso is loved here in Bamenda and we don't think anyone will want to hurt him" club chairman Yong Jacques told BBC Sport. "We've called off the two training sessions billed for today and the club is working closely with all interested parties to make sure that our coach is safe"
The club confirmed they have not been contacted with demands for a ransom as yet. Yong Sports Academy are based in the city of Bamenda, which is in one of the two English speaking regions in Cameroon, where secessionists have been fighting government forces for almost three years in a bid for independence. Despite kidnappings in the region increasing in recent months this is the first time a football official has been abducted. Yong Sports Academy are tied on 12 points with UMS of Loum at the top of Pool B in Cameroon's championship after the first phase of the league. 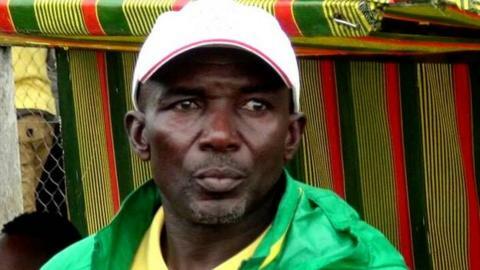 As an assistant coach he won the Cameroon Cup in 1997 with Union of Douala before wining leading Sable de Batie to the Cameroonian title two years later.